Marisa is using Smore newsletters to spread the word online. WHAT: Leyden High Schools' Leydenettes Dance Team is hosting a Lil' Leydenettes Clinic for 3rd through 8th grade students. Lil' Leydenettes will learn technique and dance routines in the East Leyden High School dance studio. 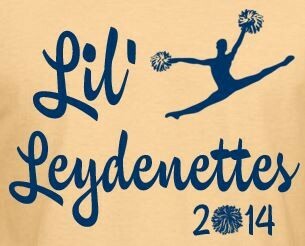 Following the clinic, the Lil’ Leydenettes will perform at the Varsity Boys Basketball game vs. Morton. WHEN: Tuesday, January 28th from 4:00pm-7:00pm, performance to follow at halftime of the Varsity Boys Basketball game vs. Morton. COST: $25.00 in advance and $30.00 if paid the day of the clinic. This cost includes a T-shirt (design shown above) and pizza. T-shirt sizes only guaranteed through pre-registration by 2/4. Anyone interested in auditioning for the Leydenettes in high school is highly encouraged to participate in this event to interact with current girls on the team and to practice their dance skills. Please return this form along with payment, cash or checks made payable to Leyden High Schools, to Marisa Kapinos, Head Leydenettes coach at East Leyden High School. If you have any questions, please e-mail Marisa Kapinos at mkapinos@leyden212.org or call at 847-451-3054. On behalf of the Leydenettes, we hope to see you there!